Manila Standard Today (link dead): Kodak EasyShare V570 is a good example of how innovation and thoughtful design can come together in a consumer product that’s powerful yet easy to use. The Kodak EasyShare V570 is a versatile compact digital camera that, despite being a bit of a concept product, is actually very easy to use. Plus, images are colourful too. DigiCamReview: The Kodak Easyshare V570 is a unique ultra compact 5 megapixel digital camera – featuring two lenses: an ultra-wide angle lens, and a normal 3x optical zoom lens. If you want a fun. easy to use, ultra compact digital camera with an ultra-wide angle lens, and intend to take mainly outdoor photos, then this camera may be a good choice. The camera offers generally quick performance, and extremely quick focusing and shutter response when using the ultra-wide angle lens. Image quality indoors was one of the camera’s weaknesses, as the camera had problems focusing in low-light when using the zoom, red-eye regularly occured, and noise was quite high. Outside image quality was better, as images had good colour, saturation, contrast and exposure, but images were generally soft. If an ultra-wide angle lens is a must, then your choice is definitely limited, however I’d recommend thinking carefully before purchasing this camera, especially if you take a lot of indoor photos of people, as the camera regularly failed to focus correctly. This is a unique digital camera, and as such, it’s difficult to come to a clear conclusion, some people may love the idea of the ultra-wide angle lens and ultra compact body, whereas others may be disappointed by the image quality. Rating: Above Average (7/10). 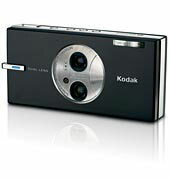 CoolTechZone (link dead): The Kodak EasyShare V570 is definitely targeted at beginners. It provides impressive results if used in auto mode as a simple point-and-shoot camera. At the same time, as consumers become more familiar with this camera, they would obviously want to tweak a few settings. The V570 will let them do that as well, albeit to a limited extent. It will let you set exposure compensation, white balance, color mode, sharpness as well as ISO speeds to allow select flexibility. Unlike some of the cameras with a complicated menu system, the V570 lets you set these pretty easily and without much fuss. At $400, this camera is no doubt a bit expensive, but then you do get the charm of owning the only dual lens camera in the world. To be fair to Kodak, while the camera definitely has some issues, the wide angle lens is amazingly good. If you want to take wide photos at close range (family portraits or group photos) you really can’t do much better than this. The ultrawide angle lens coupled with the 5x optical zoom telephoto lens yields great results. With that said, if you are already familiar with cameras, are more of a prosumer and don’t much care for ultrawide angle shots, you should look elsewhere at digital cameras that offer more tweaking capabilities. PhotographyBlog: Rating: 4 out of 5. The 5 megapixel Kodak Easyshare V570 is a very stylish and very unique camera, thanks to its innovative dual lens system which offers an ultra wide 23mm and a 39-117mm zoom lens, all in a metal body just 2cms thick. There’s obvious distortion at the 23mm end of the zoom range and the step-up from 23 to 39mm takes a little getting used to, but that’s a small price to pay for the flexibility that’s on offer. Using such a small camera with such a wide zoom range opens up lots of photographic opportunities that you just won’t get with similar sized models. The Kodak Easyshare V570 isn’t the fastest camera available, with the zooming mechanism and continuous shooting being particularly slow, although focusing in both good and low light situations is fast and accurate. The 5 megapixel sensor is modest in this day and age, but more than adequate for prints up to A4 in size. Image quality is only average, with noticeable noise and blurring at ISOs 200 and 400, which means that the V570 is best suited to situations with adequate lighting, especially if you want to make larger prints. The Kodak Easyshare V570 is just a simple point and shoot camera in terms of creativity, with no control over aperture or shutter speeds, but Kodak have gone to great lengths to make the V570 easy to use, with a wealth of playback and sharing options available. Overall, despite only average image quality and some elements of slow operation, the Kodak Easyshare V570 is an intriguing and fun to use digital camera. LetsGoDigital concludes that with the introduction of the Kodak EasyShare V570, Kodak have ventured on to a path that is not necessarily a dead-end. The dual-lens system offers potential, and will appeal instantly to a certain share of consumers. It should be said, however, that the system has not yet fully matured, which leaves Kodak room for improvement. The operation is as one would expect of a Kodak EasyShare digital camera; straightforward and with the emphasis on user-friendliness. The negative sides of this camera seem to be evened out by its plus points. Therefore, we give Kodak the benefit of the doubt, and appreciate the concept that has brought attention to the Kodak EasyShare V570; the world’s first digital compact camera with a dual-lens system. PC Magazine gives good editor rating of 3.5 out of 5 and concludes that Kodak EasyShare V570 is a unique camera that lets you capture unusual views of the world, but providing two lenses doesn’t automatically make it the best ultracompact around. DigitalCameraInfo (link dead) reviews V570 and concludes that the Kodak EasyShare V570 was designed to be stylish and sleek, but was also designed to survive in a purse or pocket. The metal construction on this 5 megapixel digital camera makes it durable and its metal lens cover protects the lenses better than most. The V570 is the world’s first digital camera with two lenses on the body. The Kodak Retina dual lens technology was developed to give users of skinny cameras a lot more zoom than can normally fit in non-extending lenses. Indeed, the EasyShare V570 uses a 23mm wide lens and a 39-117mm zoom lens to give point-and-shooters a combined 5x of zoom power. Users can tweak the zoom in the movie mode as well as the still recording modes – which all happen to be very automatic. There are 21 scene modes that will please everyone from the genealogist (Text mode) to the museum curator (Museum/Manner) to the high schooler (Portrait and Self-Portrait) to the NASCAR fan (Panning Shot). There is also a very cool Panorama mode that automatically stitches three pictures together within the camera. Most models that include a panorama mode don’t stitch the pictures together until they are loaded into editing software. The Imaging Resource concludes that the Kodak V570 presents an interesting problem for us. It’s a camera with a lot in the plus column and a lot in the minus column; yet it still nets out as a positive experience. We really like the camera for its unique dual lens arrangement that includes a surprisingly useful 23mm wide angle lens, but its image quality really isn’t as good as it could be for a 5 megapixel camera. Its fully automatic exposure control performs very well in a wide variety of conditions, requiring less exposure adjustment or tweaking than do most competing models. Auto white balance wasn’t quite as good as it could be, however, and shot-to-shot speed didn’t break any records. But for more difficult shooting conditions, a wide range of preset “Scene” modes extends the camera’s capabilities nicely, perfect for the target market. The V570’s video capabilities are also very good, both sound and video quality are quite good. While sophisticates may prefer more subdued color, we suspect that most consumers will love the bright, vibrant photos the V570 produces. But there’s still that quandary. The V570 has a 5x zoom that’s really a 3x plus a fixed 23mm; and it has two 5 megapixel sensors that produce images that really look more like they came from a 4 megapixel sensor. But we still really like the camera, so if you know these “exceptions” and still like the camera as we do, you’ll be very happy with the performance and quality you get from the Kodak EasyShare V570. At the end of the day, we had more outright fun with the V570 than any other camera we’ve reviewed for a long while. Tiny, compact, and super-stylish, the Kodak EasyShare V570 is a perfect choice for novices, as well as more experienced users looking for a capable, yet travel-worthy “fun” digital camera that can give them a wider view than ever before. All things considered, the Kodak V570 earns a Dave’s Pick.